Photo: The Bread and More ministry of Tillman Road. They’d say they’re just ordinary people doing some extraordinary things because of the grace of God. In fact, the pastor says there’s really no reason they should be doing it, especially considering the size of the church, the average age of many of the volunteers, and the budget (or lack thereof). But God said, “If you’ll trust me, I’ll use you.” And he is certainly using Tillman Road Church of God to accomplish things beyond their own abilities. The Fort Wayne, Indiana, congregation, with an average attendance of fewer than sixty, is touching the lives of nearly three hundred neighbors every single Friday. 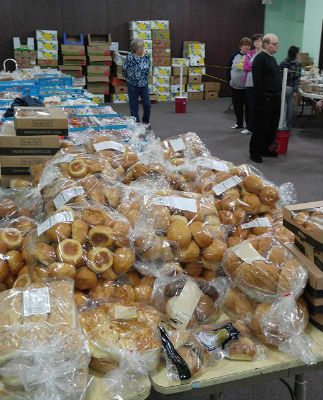 Bread and More, also known as B.A.M., is a ministry of Tillman Road that only started a year ago. When God laid the idea on the hearts of the congregation, it was met with some skepticism and even a few laughs. Of course the desire to meet a need in the community was noble; the problem was money, manpower, and a maturing congregation. Could the modest-size congregation handle the weekly responsibility? Would they have enough to give away? Or would people even come, especially since the church is not on a main road? For all of their questions, God had one answer: just obey. At first, the ministry offered one staple food—bread. After all, the church had to start somewhere, and they had to start with something that was sustainable. When only four families attended the outreach, taking at total of only seven loaves of bread, the church could have easily given up out of discouragement. Surely there were other ministries that would attract more people and offer more visible results! But God still had one answer: just obey. Tillman Road Church of God is located two miles from a food bank. The church started the Free Bread Friday by getting bread from them. Then one day someone came by and dropped off some miscellaneous food items and asked if the church might distribute it, as well. As word started to spread, the crowds started to grow. 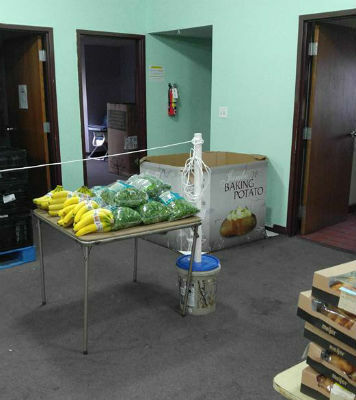 In June, the food bank stopped by and observed the success of the church was having with their food giveaway and brought up the idea of a partnership. Today the church does buy some meat and other products from the food bank, but much of what the food bank has to get rid of comes at no cost to the church. Additionally, the local Subway restaurant, which only holds their bread for six hours before having to discard it, now offers it to Tillman Road. And when the church needs additional dollars to cover shortages, inevitably a check will come in the mail with no return address. People have even walked in off the street and said, “How can we help you?” Amazing things happen when a church boldly steps out on faith to reclaim its neighborhood. 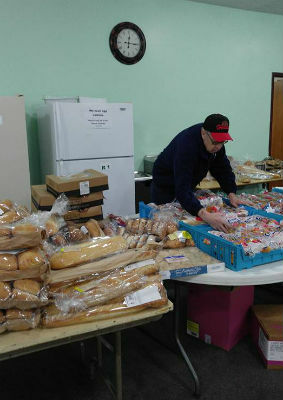 Photo: Part of the “and More” of the Bread and More ministry. One incident served as a vivid reminder of why the church keeps this ministry going, one which now requires at least twenty volunteers each week. Pastor Bill noticed a man sitting in the parking lot of the church eating the food which he had received from the giveaway. Bill asked the man why he was eating the food then and there. He explained that he knew that if he could just make it two-and-a-half more days and get to church, he’d be okay just a little bit longer. Pastor Bill Bradley believes so much in what they’re doing that he wants to make himself available to anyone who might be interested in starting a similar ministry and reclaim their neighborhoods in Jesus’ name. Contact Pastor Bill at Tillman Road Church of God at 260-447-3045 or by e-mail at pastorbill@trcog.com. In Fort Wayne, Indiana, across the United States, and around the world, God is on the move in the Church of God. Join the movement. Donate today at http://www.jesusisthesubject.org/join-movement/. This entry was posted in All Church of God, Great Lakes and tagged Bill Bradley, community service, food pantry, Fort Wayne, Ft Wayne, IN, Indiana, local church, neighborhood ministries, outreach, reclaim your neighborhood, service projects, small church, Tillman Road Church of God. Bookmark the permalink.